In the modern world, true bargains are few and far between. Up until recently I thought that Fish and Chips were the last food bargain left, that was until someone jacked up the price of Cod and quickly threw Iceland £1 curtsy into top place. Now we have a new contender- at this Chinese buffet resturaunt you can now eat as much as you like for an extremely reasonable 95p. 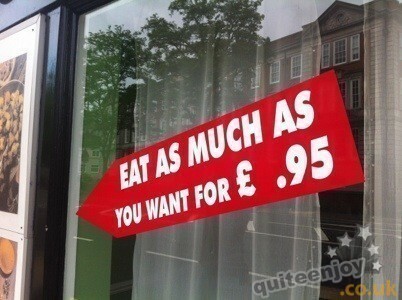 That’s increadable value, because I can eat quite a bit. Makes you wonder how they turn a profit. Also, but weird to display the price with a decimal place at the start and without the “p” at the end…you don’t think…..do you? may I suggest a white pen?